Nice and warm here in Ontario this week, but you can certainly feel that Fall is definately in the air. Time for comfort foods of every kind; my mother has started her jams. If you are a jam-maker, here is a recipe you might want to try courtesy of a Master Cook. "Even though strawberries are the classic accompaniment with rhubarb, I find more assertive berries, like raspberries, to be better. I used a mix of many this time around, with black and red currants, raspberries, blackberries, and diced strawberries, just because I had some on hand. So use whatever you wish, and frozen berries work just as well." Rhubarb doesn't have much pectin, and apple juice is used which helps the jam to set quite nicely instead of using commercial products. 1. 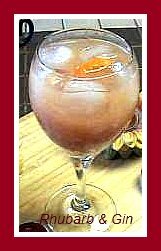 In a large pot, mix the rhubarb, berries, and the water or apple juice. 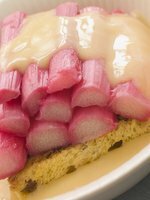 Cook, covered, stirring frequently over moderate heat, until the rhubarb is cooked through and thoroughly tender. It should take about 15 minutes. 2. Add the sugar, lemon juice, and salt, and cook, uncovered, skimming off and discarding any foam that rises to the surface, until the jam is thick and passes the wrinkle test. To do so, place a small spoonful of the jam on the frozen plate. Return it to the freezer and check it a few minutes later; if the jam wrinkles when nudged, it's done. You can also use a candy thermometer; jam jells at approximately 220F (104C). 3. Stir in the kirsch, if using, then ladle the jam into clean jars, cover, and store in the refrigerator. Tip - A pinch of asorbic acid will keep rhubarb pink. As rhubarb is only grown by 11 producers in the "rhubarb triangle" in England, top rhubarb producer Janet Oldroyd (the lady with those eerie forcing sheds) is among those applying for "recognition of the rhubarb crop" to save the industry. Food producers in Britain are encouraged to apply for Protected Food Status, which will prevent inferior foreign immitations of the products, and help sustain rural communities. Products must be registered with the European Union. 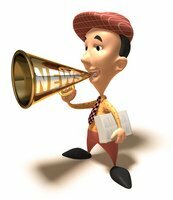 The new food and farming Minister has officially called upon British producers to protect their legal status by registering, so this event is quite important and exciting for those who can have the authenticity of their foods recognized and guaranteed. Consumers are quite prepared to pay a little more for the specialties of the region. 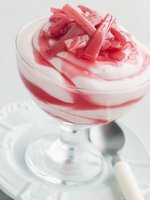 Tip - Use fresh rhubarb as much as possible, but if frozen, your recipe may require a longer baking time. Add an extra bit of thickener to allow for the extra moisture. Partially thaw, and get rid of as much of the ice crystals as you can; shake it off and soak up the excess with a towel. Preheat oven to 350 degrees. Grease a 9 x 13-inch baking pan; set aside. Combine shortening, brown sugar, and egg; beat until light and fluffy. Combine the flour, baking soda and salt together; add to the egg mixture alternately with the buttermilk, ending with flour. Fold in the rhubarb and mix in well. Pour mixture into the prepared pan and bake at 350 degrees for 30 to 40 minutes until a wooden toothpick inserted in the center comes out clean. Cool before cutting. Serve with whipped cream, if desired. A little rhubarb trivia - did you know? 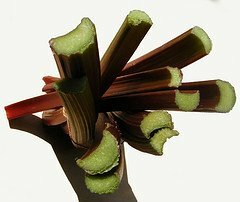 During the first Opium Wars (trade dispute between China and the British Empire in the 1800's) it was believed by the Chinese that if they cut off the export of rhubarb to the British, the country would become incapacitated from constipation and other ailments. This "tactic" did not work however. "Donkey Rhubarb" actually refers to the drug-oriented uses of marijuana. Someone asked what to cover their rhubarb with over the winter months. Manure and straw are 2 good ones. Cute Kids! And Yet Another Use For Rhubarb! They've got the right idea.